What began as the Lafayette Zoological Park in 1901 is today the Virginia Zoo in Norfolk, which celebrates its 115th year. The zoo covers 53 acres adjacent to Lafayette Park and is bordered by the Lafayette River. More than 500 animals that belong to 100 species call the zoo home. Popular mammals live at the zoo for your viewing pleasure. Here are a few. The zoo’s female, Zola, weighs in at 344 pounds, while her mate, Mramba, is sized at 364 pounds. Mramba is more reserved, but Zola has a quick temper. 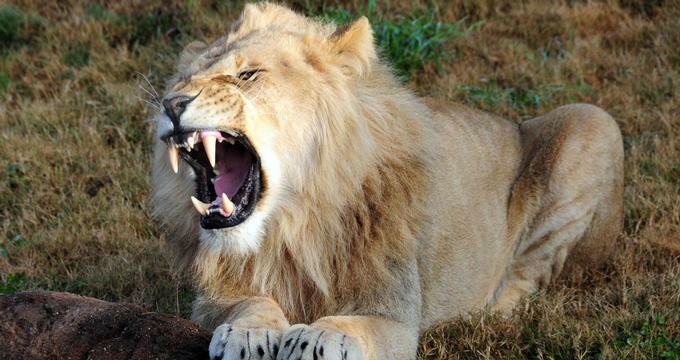 The lion’s roars are thunderous and can indeed be heard across the zoo. In 2009, Zola had four cubs: one female and three males. These lions call the south Sahara Desert and parts of southern and eastern Africa home. Lions are considered the only cats to live as large families called prides. The zoo shows two of these animals: a female and a male, and is hopeful the two will breed. Their zoo habitat includes a viewing area through which visitors can watch the otters swim under water. These bears are also known as moon bears, due largely to a white patch of fur that is said to look like a crescent moon. The zoo has two of them: Chai and Thai, who are brothers. At 450 pounds, Chai weighs more. Moon bears call Southern Asia, Korea and northeastern China home and, while sized similarly to the North American black bear, the thicker mane of fur around their necks distinguish these bears at the zoo. The zoo boasts two binturongs: Suzy, its female; and Rungus, its male. Binturongs are not related to cats or bears. Bongos, generally considered timid, are the heaviest type of forest antelope. Its bright chestnut color grows darker as the animal ages so that old males are nearly black. The body is highlighted with 12 to 14 narrow white stripes on the shoulders, flanks and hindquarters. They have particularly big ears, which are thought to heighten their sense of hearing. Bongos hail from the Lowland Rain Forest of West Africa and the Congo Basin to the Central African Republic and Southern Sudan. Tapirs are endangered. Often, people think anteaters and tapirs are the same, or that the tapir is a cousin of the elephant. In fact, Tapirs are considered a primitive herbivore, and are most closely related to the horse and rhinoceros. The zoo has two of them – a male and female. They prefer aquatic vegetation, grasses, buds, leaves, soft twigs and fruits of low shrubs. 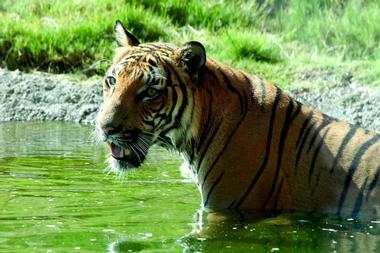 Christopher and Api are the zoo’s Malayan tigers, an endangered species. It is said there may be as few as 600 in the wild – that is the tropical forests of the southern and central Malay Peninsula. These tigers are perhaps the smallest subspecies of tiger; adult males weigh about 300 pounds; females weigh in at about 200 pounds. In their natural habitat, they feed primarily on wild boar and deer. Four giraffes call the zoo home. Giraffes are known to be the tallest among land mammals, and their height gives them the advantage of seeing danger from afar. In addition, their eyesight is excellent. This combination of height and superior eyesight makes them the first to run if they are aware of danger, giving other animals the signal that they should run, too. The male orangutan can be as heavy as 300 pounds and up to five feet tall; females are often less than 150 pounds and are shorter. There are four orangutans at the Virginia Zoo. Their body types suit them as they swing between branches – a movement called brachiating. Orangutans love to eat insects, bark, fruit and early shoots. Orangutans are today seen on the islands of Sumatra and Borneo. Sumatran orangutans are fragmented into nine separate populations. Bornean orangutans are much more widely distributed. Red pandas are endangered, owing largely to the loss of their habitat. There are less than 2,500 adults in the world. Oscar became a zoo resident in 2008 and Missy arrived in 2011. Bernadette came on the scene in April 2012. Oscar and Bernadette produced two male cubs in 2013, and in 2014 they had two female cubs. The siamang is the largest member of the gibbon family. The zoo has four siamangs. They are graceful, as they leap across substantial gaps between ropes or branches in both their outdoor habitat and indoor play area. Siamangs are endangered as humans invade their habitat – sometime destroying the mother siamang to get at the young because of the market for them as pets. The zoo’s male and female weigh about two pounds each, and love to dig. In fact, visitors will recognize their exhibit by the significant tunneling. When they’re not lounging in the sun, they are eating one of their favorites – meal worms. 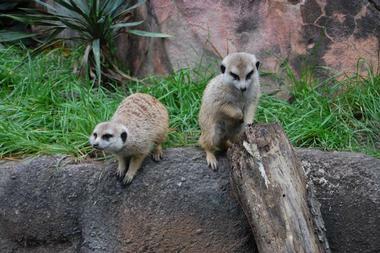 In the wild, guests would find meerkats in the South Africa’s Kalahari Desert. They are territorial creatures and are known to protect their turf against other gangs of meerkats, or mobs. Since security is uppermost, they stand guard and make emergency calls to one another. In their natural habitat, squirrel monkeys congregate in large groups because they find safety in these large numbers. Being in big groups prevents larger monkeys from chasing them from their trees. Mothers carry the babies around on their backs. Their home range is east of the Andes from Columbia and northern Peru to northeastern Brazil. This squirrel monkey population at the zoo is a curious lot and loves to swing from their vines. They weigh less than two pounds each and are partial to bananas and marigolds. White-cheeked gibbons are considered Critically Endangered, owing to habitat and hunting losses, but the zoo is fortunate to have one male and one female who, incidentally, look completely different from one another. Females have white fur, with a tiny patch of black on top of their heads. Males are completely black save for patches of white on their cheeks. Babies have fur as white as their mom’s – think camouflage – but they turn all black by one year of age. Yet, when they reach young adulthood, the males remain black, while their counterparts become white once more. Alfred, the zoo’s white rhino, was born in 1968 – making him one of the oldest residents. He’s not the lightest, though; Alfred weighs in at 4,200 pounds and really digs mud. The white rhino is listed as highly endangered; there are less than 3,000 living in the wild. While most guests visit the zoo with the animals uppermost in their minds, plants are the first to greet them. 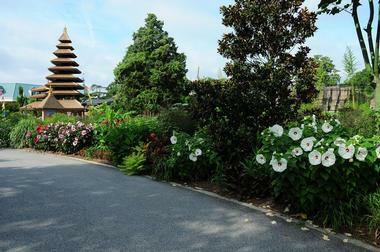 The zoo’s horticulture sets the stage for guests and residents of the Zoo. Naturalistic habitats for exotic and native animals have been created, and the zoo designs and grows its plant-themed gardens, which also offer fresh plant treats for animals. In the African Village Garden, African flowers and vegetables remind visitors of the exotic origins of many favorites from the region. The Butterfly Garden exists in a corner of the zoo, which attracts butterflies and caterpillars. In Color Gardens, visitors can immerse themselves in their favorite colors. Choose from yellow, white, orange and blue-themed gardens. The Herb Garden is a remarkable combination of beauty and usefulness. Modern and antique roses grow here in his amazing Organic Rose Garden area of the zoo. In one spot, the Ornamental Grass Garden, visitors can get a sense of the many colors and forms of the grasses that grow throughout the zoo. The Rain Garden shows how storm water is managed at the Fountain Plaza. The Shade Garden provides a peaceful respite for visitors. Here plants like leopard plants feel right at home. In the Tropical Garden, you might be fooled into thinking you’ve walked into Bali by the look of the tender, hardy plants that create a tropical feel. The African Village Café is situated by the entrance to the Okavango Delta. It is a full-service restaurant, serving goodies from salads to pizza to grilled chicken. The meals are as awesome as the view and there is outdoor and indoor seating and kids’ meals and family meal options. The Barnyard Beastro sits near the front plaza and the Zoo Farm. It offers all-beef hot dogs, pretzels, popcorn, and nachos to quell your cravings. Ice cream is available as well. The Dippin’ Dots stand is directly across from the rhino statue, and is the perfect place to find refreshment before beginning the trek into Africa. The Snack Shack sits at the front entrance, and offers snacks and bottled water to carry visitors throughout their day at the zoo. 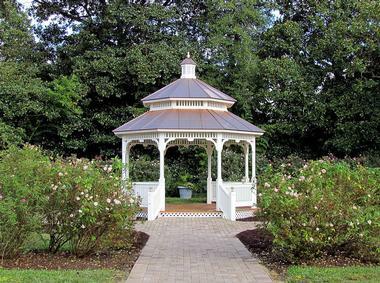 For a picnic lunch, think about Lafayette Park, just outside the Virginia Zoo. The park includes picnic shelters and a new playground. Visitors who decide to leave the zoo to picnic, simply show their admission receipt at the ticket booth to re-enter after what promises to be a delightfully satisfying outing.